With this design-conscious Hoola Hup of the latest generation you can literally make the wave because its dynamic design will perfectly fit to the rhythmic movements around your hip. The precise handwork (made in Germany) ensures that this Hula Hoop offers an excellent impression even at first glance. This Hula Hoop makes a good impression not only visually because it is a highly effective equipment which demands the whole musculoskeletal system and which can visibly contribute to tightening the figure. To make you feel comfortable while Hula Hooping in any way, appealing functionality in addition to a modern design ensures a noticeable value: Please choose when ordering an individual diameter to create a perfect fit as the basis for an effective workout. 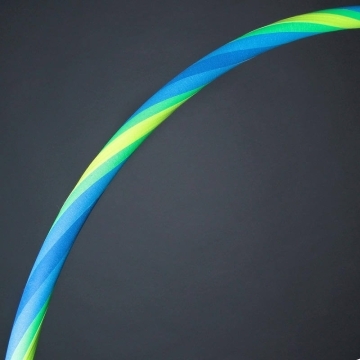 Due to the low strength of the tube (extremely stable HDPE), this Hula Hoop only weighs maximum 380 grams which is reflected in a high training comfort. Design Hula Hoop "The Wave": Are you ready for something special? Do you want a different diameter? Please make a personal support request! With this Hoola Hup, you are part of a new "Sporty Wave"
The trend sport Hula Hooping conquers more and more hips around the world. Not by chance, because this sport which is still very familiar from childhood/adolescence allows promoting the weight loss with power and a high degree of vitality. And with this designer Hoola Hup, you can also show your design-consciousness and you may workout anywhere flexibly. You buy with this model a practical Travel Hoop: a few simple steps are sufficient thanks to folding function to reduce the size so that a space-saving transport is possible. We make your wishes possible: Please send us a direct support request if you are looking for a specific diameter. We are looking forward to hearing from you!